After I reported on Gabe’s day at the office and described his artwork, he read the report and informed me that the second picture wasn’t the pins being knocked down. 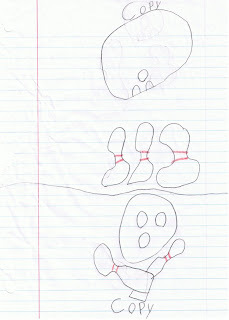 “I put the ball instead of a skull, and then used two pins instead of bones,” he explained. ← Summer Vacation, Day 56: Go Yankees!